This is part of a series of articles on games in Budapest – a link will be added here when the summary article is published at the end. On a previous visit to Budapest, we’d played the three games at Mystery and been impressed with two of them. They’d included some fun physical puzzles, but the thing that had most stood out about them was their ability to make searching fun – turning it from a tedious process into something that felt more like a puzzle. We’d seen the impressive outside of their submarine game at the time, but it wasn’t quite ready for launch so, when I booked in the return visit to Budapest, it was high on my to do list. Immersion, if you’ll forgive the pun, is key in this room. From the decoration on the outside of the game and the door that lets you in, it’s clear that they wanted to make something that really felt like a submarine. And they’ve managed it. 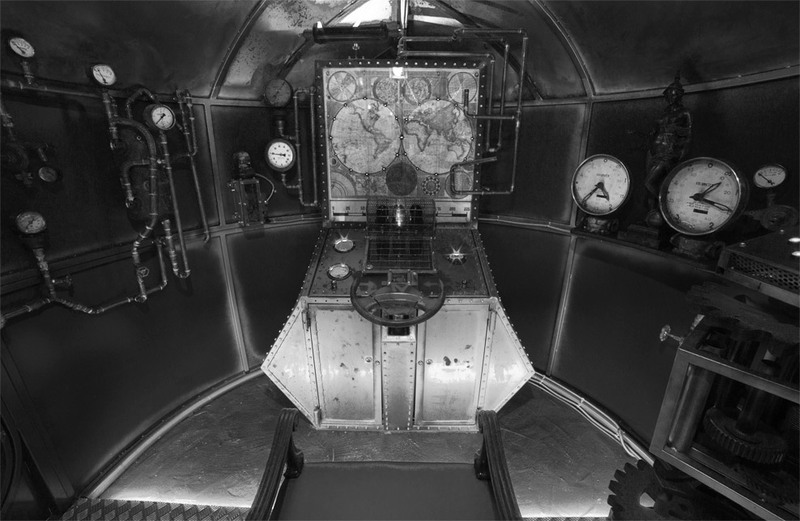 Inside, you’re greeted with a cramped, dingy space full of metal piping, lights and a feeling that you’re surrounded by important machinery. That was both a blessing and a bane: while the immersion worked well, we were left struggling, particularly at the beginning, in low light and with a plethora of red herrings. Those red herrings, combined with a distinct lack of signposting to hint at what we might need to do next, meant we spent a lot of time investigating and re-investigating objects that were merely there to make the space look more submarine-like. On top of that, a lack of in-game feedback resulted in us sometimes solving puzzles and neither knowing whether we’d got the correct answer nor what had happened if we had. With them trying to get the cramped feeling across to the players, you might think that you’d feel confined but, after the start to the game, I wasn’t aware of being short of space and, with the game flow pulling us back and forth within the room, I rarely felt we were getting in each other’s way. Puzzle-wise, they throw you in at the deep end with a tough physical team challenge early in the game, where we really struggled. While I think that challenge would have been a good addition to a game in some circumstances, here I felt it didn’t fit amazingly well with the theme and came too early in the flow. There’s little they can do to help you, and there’s a decent chance people will get frustrated before it’s finished. Once that was out of the way, though, we found plenty of fun puzzles to keep ourselves occupied, with an even better level of physicality than I’d anticipated going in. Not in the sense of dexterity or skill challenges but in the sense of having to physically interact with the vessel. With all the machinery around us, that probably shouldn’t have come as much of a surprise, but it was welcome nevertheless. That physicality translated into the finale in a pleasing manner, with my only complaint being that it wasn’t entirely obvious that we’d actually finished until we tried the door to make sure. That’s all on Mystery Games – want to read more about other local games? A link will be added here when the summary article is published at the end.